Ella bursts out a bit of 'No Tears Left to Cry' too! 'Answerphone' is one of the biggest songs around right now - so we just had to get the geniuses behind it in for a lil' chinwag. 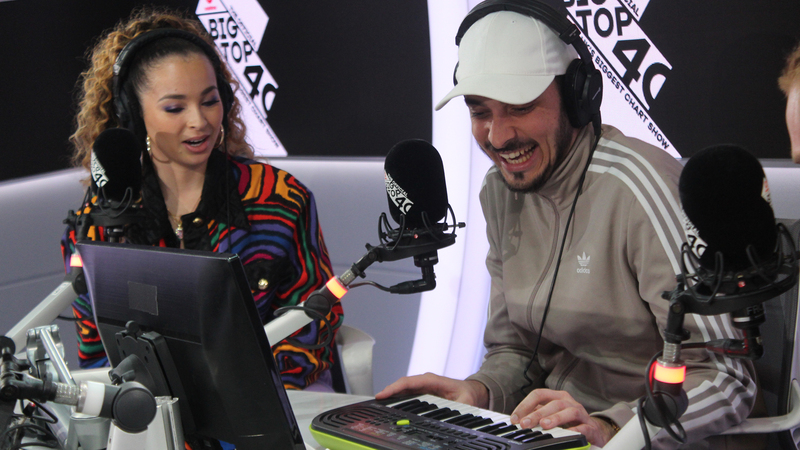 Ella Eyre and Banx & Ranx swung by for a catch-up with Kat Shoob on The Official Vodafone Big Top 40 to spill all the details about their huge summer anthem. It turns out when you're as talented as this lot, it doesn't take long to write a hit. Ella Eyre revealed that it only took a day to record 'Answerphone' when the Montreal-based producers were over in the UK. The pair didn't actually know who Ella was, which sounds quite awkward but... Ella hadn't heard of them either! It's all good now though - the trio seem to be best of friends. Obviously with a track named 'Answerphone', we wanted to find out about some of the voicemail messages they'd been left in the past. Rudimental are probably the most famous name to have slid into Ella's voicemail inbox, while it's Sean Paul for the Banx & Ranx boys! Before they went, we had to get the gang involved with our classic classroom instruments covers challenge (yeah we're still working on the name). We're not sure what song they were trying to play but we appreciate the effort nonetheless! > Where did 'Answerphone' get to on this week's chart? See the full Top 40!